• The cars of the future: The competitively priced plug-in hybrids that will get 60 miles to the gallon, and the battle being waged by fifteen start-ups competing to capture the electric car market. • The fuels without fossils: New sources of energy from plants such as prairie grass and algae that could capture a big chunk of the $300 billion U.S. wholesale gasoline market. 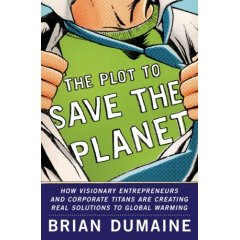 • The corporate mavericks: Companies such as Duke Energy and GE who are creating the low-carbon business models of the future, as well as cleaner ways to provide our power needs. • The energy-miser homes and buildings: The new Bank of America Tower in New York City and the green low- and middle-income homes being constructed by visionaries who were told it couldn’t be done and still be affordable. • The “thin film” solar energy: How it is making the cost of heating a home comparable to traditional methods without emitting greenhouse gas.